Today I'm thinking about the meetings with I hold with clients. I love our conversations over Skype when the couples' cute faces pop into the screen-- excited, expectant, filled with the promise of possibility for that which we are about to create together. Brainstorms and flurries of images, colors, and impressions from daily life are shared. Rituals, family traditions, the story of when the couple met for the first time, awkward moments, and stories of loved ones we wish could be here to see them now-- these are all on the table. We ruminate, we find metaphors and stories that will move us toward synthesis and production of sketches and eventually, a final artwork. 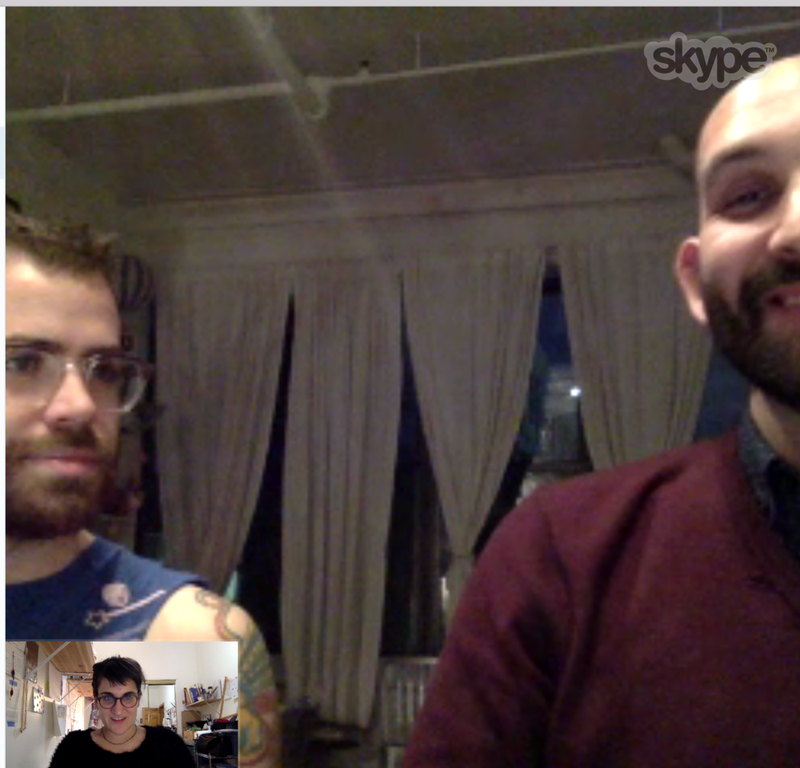 Above: The first creative meeting held with Jeremy and Aaron (located in Brooklyn, NY) over Skype, to start thinking about their Ketubah for their August 2017 wedding. This Shabbat I'm taking some time out to consider how we communicate with those who are most present in our lives-- our lovers, partners, siblings, parents, children, etc. How can we build and maintain deep connections? How do we hear one another in full and to the best of our fallible abilities over a long course of time? The adage goes, "communication is key", but what sort of communication would that be? How does one know the right time to communicate which information? Do we speak every thought out loud? This is something I am constantly tuning for myself in relation to a wide variety of relationships but most consistently with my partner, Dylan. My favorite tool is an exercise we learned through our meditation teacher in a class we took over the summer, taught in collaboration by Mishkan Chicago and Orot Center for New Jewish Learning. Person 1 begins. They speak, telling Person 2 about the events of their day: the struggles and how they responded to difficult experiences, and/or how they might have responded in a more productive way. Person 1 talks about triumphs, successes, and the mundane. They might list off events that happened chronologically or stick to one major happening. It may take 2 minutes to explain, it may take 20 minutes. Either way Person 1 is able to explain themselves and in a sense this prepares Person 2 for the type of mood or headspace that the speaker has been inhabiting since the last time the two met. Person 1 is able to feel that their experience is valid. They may be heard. When Person 1 feels satisfied with their explanation, they say: "Dibarti", or " I have spoken" and Person 2 responds, "Shamati", or "I have heard you". Then the roles switch and Person 1 becomes the listener. Person 2 becomes the speaker. When they are finished, Person 2 says, "Dibarti" and Person 1 responds, "Shamati". This simple exercise has been an immensely helpful tool for coming to know my partner better, and evaluating my own reactions to the world. I recommend it to anyone interested in building a listening and sharing practice with another. Last night another exercise came to my attention. This shabbat we hosted 5 new friends around the table as a part of One Table and Mishkan Locals. One guest shared a tradition from her own shabbat experience: before lighting the candles, each guest verbalizes something they are letting go of from the past week, and then names something they'd like to welcome into their lives in the new week. Letting go of bad feelings, letting go of mistakes, letting go of unhealthy habits and welcoming the opportunity to be a better version of ourselves. For me this week I hope that means writing up a budget I can stick to! In the interest of developing practices or conversational strategies that encourage open dialogue, I encourage anyone who has thoughts on this to reach out. I'm curious to learn about what works for you, and to share these ideas with those who are interested. Sending love to all of you out there in the universe. It's Halloween, or Samhain in Pagan or Gaelic tradition. This is the marking of a new year in these cultures. The seasons change and we must adapt as well. We move from the outward to the inner, the above to the below. It is the time when the veil to the spirit world is most thin and it is common to hold seances and rituals to connect with those who exist in the other realm. On my personal journey, I am continually looking to learn and to share traditions and rituals. I was honored to have been invited to participate in a ritual led by my new friend, Lyra Hill, a talented artist and priestess, in her cozy Chicago home last night on the eve of the holiday. An intimate group gathered in the front of the apartment, lit by candles. We made agreements together for the safety of all those taking part. We would respect one another, no cell phones, you can leave if you would like to. We called for help by invoking the goddess Hecate, we called upon ancestors and descendants, upon the elements of Earth, Air, Water, Fire, and Center. Bravery, Presence, Calm, FUN, Sovereignty, The Moon. In a guided meditation portion of the ritual I was able to access a space that I shared with my mother, my aunt, and and grandmother, who led me through the landscape of the spirit world. The message they left me with: "we will be with you, but you're going to have to work for it". YOU'RE GOING TO HAVE TO WORK FOR IT. Whatever that thing is. Whether it be ending the destruction of our water sources, being more open to the pain, suffering, and misunderstanding in this world, finding our spiritual center, making sure our loved ones feel our appreciation for them, learning to retain and embody presence of mind, building a successful business, earning a new job, standing up for ourselves, calling out bigotry and injustice... you're going to have to work for it. The ritual left me feeling sad, strong, connected, appreciated, and grounded. May we have the strength and presence of mind to work for that thing. May we have the support of a community and the spark of curiosity deep in our bellies leading the way. Sending strength to all as we enter the cold seasons. I leave you with one of my favorite images, it is a painting called Soft Power, by Indianapolis-based artist, Casey Roberts. To me, this is the embodiment of Autumn emotions. Bat Sarah Press creates ritual art for a contemporary world. The company sells an array of contemporary art works including culturally Jewish items and services. BSP believes that art is a gateway into ritual action and a holder of historical and mystical narratives. Through artworks and the sharing of culture we can better understand, relate to, and appreciate the roots of Jewish heritage. Those who are searching for it can find a personal connection to Judaism and how it lives in contemporary society. Bat Sarah Press is the work of Chicago based artist Rachel Ellison.